A spectacular home, Luna Sea is located in the heart of Corolla and close to a wealth of exceptional attractions, shopping and Outer Banks restaurants, this beautifully appointed vacation rental retreat are outfitted with everything guests need to have a blast – both in the neighborhood and close to home. When guests are getting their toes sandy at the nearby pristine Corolla beaches, they’ll want to spend sunny hours by the outside private pool which features a lush natural setting, a poolside hot tub for effortless relaxation, and a nearby outdoor shower for added convenience. Step inside the entry and head upstairs to refresh after a long day by the water in the second level’s trio of brightly decorated bedrooms. With a kid-friendly bedroom with a pyramid bunk, a bedroom with queen bed, and a master bedroom with queen bed and full bath, everyone can find their own private corner of Luna Sea to call home. Celebrate the beach life by gathering with the group in the top level’s spacious great room. The living area is outfitted with soft furnishings and a refreshing dose of natural light, while the dining area and kitchen are the perfect havens for hungry vacationers who appreciate family feasts. 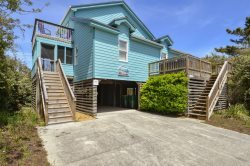 A master suite is also located nearby with a queen bed and full bath, and a pretty outdoor deck serves as the perfect spot to toast the end of a brilliant OBX day while admiring a towering view. With artful touches like flat screen TVs in every bedroom and relaxed furnishings that allow guests to ease into a vacation state of mind, Luna Sea is a great destination to forget your cares and dive into the relaxed beach lifestyle. Perfectly modern but sweetly inviting, this vacation rental is a paradise where the beauty of the northern Outer Banks truly shines. .7 mile /15-minute walk or 4-minute drive to Bonita Street beach access with public parking.